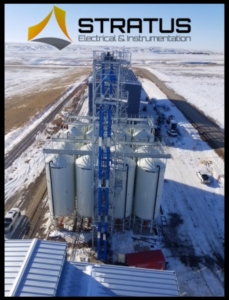 Agriculture Project in Saskatchewan | Stratus Electrical & Instrumentation Ltd.
One of our Stratus crews have been working in Verwood, Saskatchewan building a lentil cleaning/splitting facility. The crew lead by Jacob Munro have been doing a outstanding job exceeding all customers expectations. Here is a great view of the site from the top of the clean leg elevator.